Eggs and fish roe are a classic combination. Herring roe is sold in a jar and is wonderful to use as a topping for canapés. 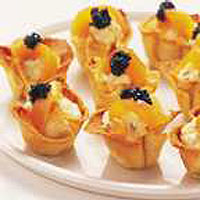 Serve these canapés with chilled white wine as a light starter to accompany our recipe for pan-fried swordfish. Place the eggs in a saucepan and cover with cold water. Bring to the boil and cook at a steady boil for 5 minutes. Drain and run the eggs under cold running water, then peel. Brush a mini-muffin tin or small bun tray with butter. Remove the crusts from the bread then roll each slice with a rolling pin until halved in thickness and butter one side of each. Press the slices carefully into the muffin tin and bake for 10-12 minutes until golden brown. Cool on a wire rack. Finely chop the eggs and mix with the crème fraîche, seasoning and chives. Divide the mixture among the 12 cases. Top each with a twist of smoked salmon and 1tsp herring roe. The crisp cases can be made well in advance and can be stored for a day or so in an airtight tin. The egg mixture can also be made a day ahead but be sure to assemble the cases only an hour or two before eating so they stay crisp. You can substitute smoked trout for the salmon or omit it altogether. This recipe is not suitable for the young, pregnant women, elderly people or those whose immune systems are weak.